SILVER SPRING, Md. 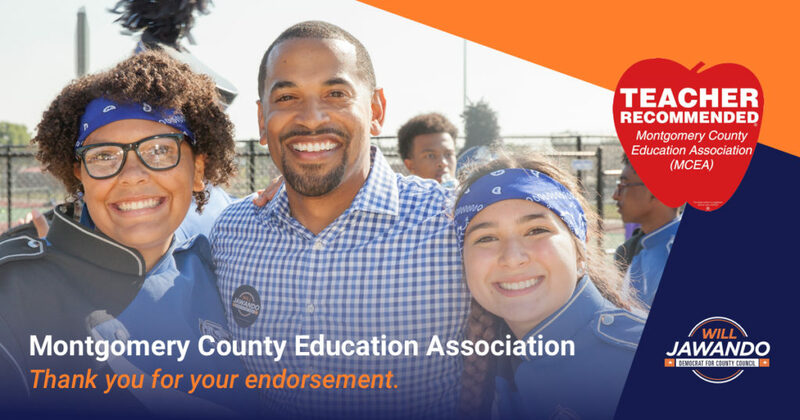 – Today the Montgomery County Education Association announced its slate of recommended candidates in the June 26 primary, including on that slate Will Jawando in his campaign for County Council At-Large. The MCEA is one of the county’s largest public employee unions, representing more than 14,000 teachers, classroom specialists and counselors. “I have to thank our public school teachers for their support and trust in me. It means a great deal and I am truly thankful. I’ve worked my entire career, from my work locally building career readiness programs and working to close opportunity gaps, to my work at the Department of Education and the Obama White House, to ensure all our children have access to a world class education. I’m honored that MCEA is putting me on the Apple Ballot,” Jawando said. “A high quality public education is the foundation of what I call the Montgomery County Promise — a great school in every Zip Code, and a world-class education no matter your skin color, ethnicity or income. I’m running to keep that promise to everyone in Montgomery County,” Jawando said. The MCEA recommendation follows recent endorsements of Jawando’s campaign by Progressive Maryland, Local 500 of SEIU, and the Sierra Club.